The advent of social media has led to the ability for individuals all over the world to communicate with each other, in real time, about mutual topics of interest in an unprecedented manner. Recently, the use of social media has increased among people interested in healthcare and medical research, particularly in the field of hematology and oncology, a field which frequently experiences rapid shifts of information and novel, practice-changing discoveries. Among the many social media platforms available to cancer patients and providers, one platform in particular, Twitter, has become the focus for the creation of disease-specific communities, especially for those interested in, affected by, or those who perform research in the fields of rare cancers, which historically have had a dearth of reliable information available. 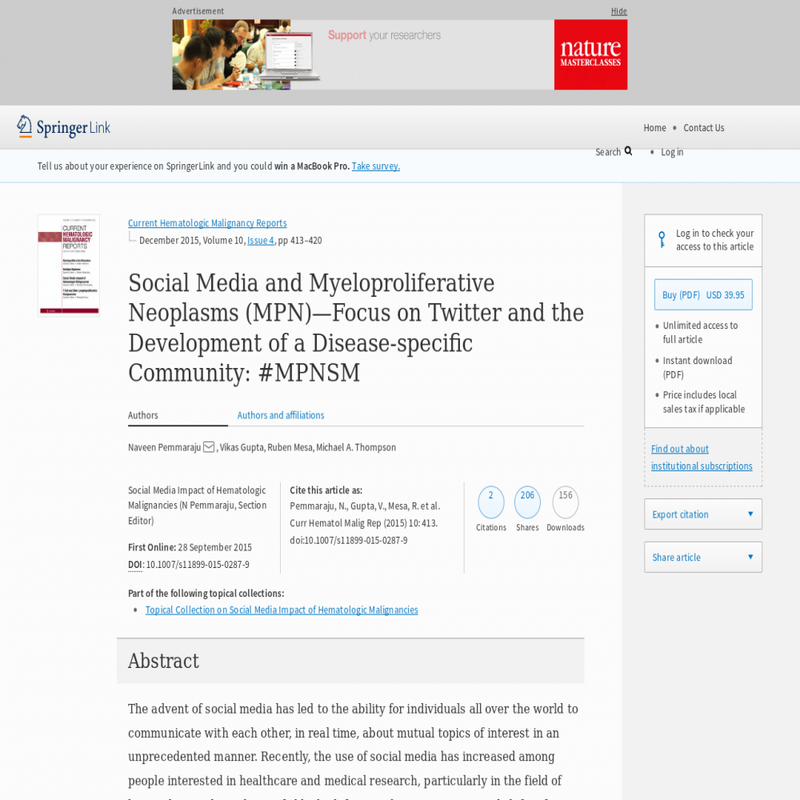 This article will focus on the initiation and progress of one such Twitter hematology/oncology community, #mpnsm, which was originally created for the purpose of serving as a venue for improving the interaction among patients, providers, researchers, and organizations with interest in the myeloproliferative neoplasms (MPNs) and to further the availability of reliable up-to-date analysis; relevant expert commentary; and readily usable information for patients, providers, and other groups interested in this field.